Richard worked in a range of operations, logistics, freight forwarding and transport management roles for 13 years in West Africa and the United Kingdom before beginning an academic career in 2002 at the then Institute of Marine Studies, University of Plymouth, England. In 2004, Richard moved to Australia to take up the role of Lecturer at the School of International Business, Queensland University of Technology, Brisbane from 2004 to 2008. Richard has been lecturing Logistics, Operations, and Supply Chain Management at the Newcastle Business School, University of Newcastle in Australia since Jan 2009. He has undertaken and published research in the area of logistics for disaster preparedness and response, humanitarian logistics and humanitarian operations management in leading refereed journals in Logistics, Operations and Supply Chain Management. Richard won the first competitive seed corn funding for research into Humanitarian Logistics by the then Chartered Institute of Logistics and Transport UK in 2001. Most recently he won the Humanitarian Innovation Initiative (HI2) seed grant funding of Brown University to explore logistics models for the delivery of healthcare commodities in emergencies to developing regions. Richard is a founding member of the editorial advisory board of the Journal of Humanitarian Logistics and Supply Chain Management, and the International Journal of Physical Distribution and Logistics Management. Richard has won several Australian and international prizes and awards for his teaching and research, most recently in 2018, the Certificate of Outstanding Contribution in Reviewing Award (by Elsevier Publishers and the Editors of the International Journal of Disaster Risk Reduction); the 2017 Faculty of Business and Law Early Career Research & Innovation Award; the Faculty of Business and Law Individual Teaching Excellence Award (2017), the Emerald Publishers Outstanding Reviewer Award in the Emerald Literati Network Awards for Excellence (2015), Vice-Chancellor's Teaching Excellence Award (2013) and the Highly Commended Thesis Award in the 2013 Emerald/European Fund for Management Development Outstanding Doctoral Research Awards. 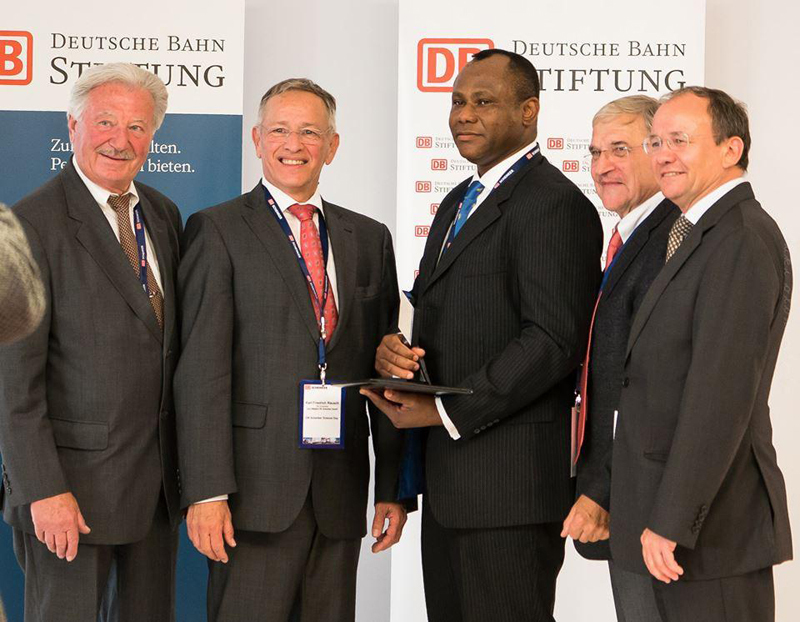 In September 2014 Richard was awarded the prestigious DB Schenker Award for Outstanding Research in Logistics for his research: "The Implications and Limitations of Commercial Supply Chain Management Process Models and Frameworks for Disaster Relief." Logistics and supply chains for humanitarian aid. Disaster, emergency and crisis relief chains. International logistics and International Transport/ Shipping. International Trade and Transport facilitation. Logistics, Supply Chain Management, Operations Management. Strategy Formulation & Environment Scanning, Program Management, Management of Internationalisation & Student Recruitment, Management of Credit & Student Mobility/Recognition of Prior Learning; and Research & Editorial Management. Richard has on-going research collaboration in the area of disaster response logistics with collaborators at the Institute of Transport Logistics at the Technical University of Dortmund (TU Dortmund, Germany), the Fraunhofer-Institute for Material Flow and Logistics in Dortmund (Germany); and the Humanitarian Logistics Institute at the Hanken University in Finland. Richard also has on-going research collaboration with the New Rail Research Hub at the School of Mechanical and Systems Engineering, University of Newcastle upon Tyne in England; Strachlyde University Glasgow on sustainable supply chains and early stages in innovation in technologically-intensive businesses; and with the W.Carey School of Business at Arizona State University, Tempe on innovation in humanitarian logistics and supply chains. © 2013, Taylor and Francis. All rights reserved. This chapter investigates an alignment of issues in security, risk and vulnerability analysis to present a comprehensive framework for designing an integrated safety-crisis culture across maritime supply chains and associated workplaces. The framework examines systems and processes for training, including needs analyses, covering crisis management capacities that enhance vulnerability analysis in maritime trading systems and the security assurances of supply chains. A combination of primary and secondary data sources from maritime and related industries in Europe and the Asia-Pacific region will be applied in a comparative analysis of practices and theoretical approaches to safety and crisis response. The scope of the chapter is limited to the requirements for designing, developing and implementing safety and crisis management cultures in organizations across maritime supply chains. The study reinforces the unique security challenges in the maritime operating environments and in regional port settings. It also details a selection of innovative strategies for mitigating these issues and challenges and in generating a capacity to anticipate some types of crisis. In summary, the authors find the need for development of flexible¿yet specific practices¿that must be embedded in the operational and managerial repertoire of commercial participants of maritime supply chains internationally. These practices (via the organizational culture) must be adaptive to emergent conditions yet grounded in professional knowledge. © 2017 Elsevier Inc. The case study on the re-building program of the Victoria bushfire disaster of 7th Feb 2009 provides insights on the relationship between governance structures in post-disaster re-development and the goal of building sustainable and resilient communities. The paper links ¿governance¿ to ¿resilience¿ using Stage VI of Turner&apos;s 1976 model as a theoretical lens. A qualitative research strategy was utilized to elicit descriptive qualitative responses from which research goals were addressed. The findings show that the design of governance structures for re-building after a disaster impacts the ability to secure resilience. Also, several resilience aspects seem to be impacted by governance issues relating to: the balance between urgency vs. need of space; the role of formal and informal stakeholders; the social-psychological dimension in information sharing as well as entrepreneurial opportunities in rebuilding, and economic sustainability. © Emerald Group Publishing Limited. Purpose - Railway transport being a "service" is provided in a space and time dimension. Providing a better quality of service requires higher inputs, so evaluating the performance without these considerations would give a biased result. The purpose of this paper is to assess the performance of the rail transport service by including the service delivery perspective of railways and look at the holistic concept of service delivery. The quality of service parameters have been chosen within the constraints imposed by availability of data and the formulated data envelopment analysis (DEA). The quality of service parameters include: punctuality; the level of consequential train accidents (safety); and the level of public complaints (customer satisfaction). It evaluates the performance of 16 zones of Indian railways (IR) on the basis of their efficiencies and identifies the exemplar zones. The results deduced from these studies can serve as performance targets in reward systems, performance scorecards, and control systems. Design/methodology/approach - DEA has been used as a benchmarking tool to evaluate the relative efficiency of the 16 zones. The input parameters are working expenses, number of employees, and equated track kilometers and the output parameters are loading of revenue, punctuality, passenger traffic kilometers, consequential train accidents, and public complaints. Malmquist index has been used to determine the temporal performance of each zone. Findings - IR can use DEA to assess the performance of various zones and for improvement monitoring in the context of being a transport service provider. Inefficient zones can identify the parameters for improvement across the zones and along the time dimension. A huge working force for all the inefficient zones indicate over deployment of resources, which can be seen at the policy level. A redundancy for equated track kilometers indicates a non-optimum use of resources. Not giving enough importance to service quality could be one of the major findings of the inefficient zones. Research limitations/implications - The scope of the quality of service variables assessed could not be enlarged in this study because of the limitation of the number of variables that can be chosen for a given number of decision-making units in the model. It is not always possible to compare each zone on an exactly equal basis as the work culture and challenges differ across zones, units, regions, and states which poses a limitation to the study. Practical implications - The holistic evaluation of performance of IR by inclusion of the service parameters can have important implications for the industry. The choice, incorporation, and interpretation of the parameters of this study can be adopted for rail transportation industry. This also summarizes the essence of performance and quality of service in public rail transport sector. Social implications - The global public transport sector, and the rail mode in particular faces the challenge of identifying, and using appropriate service quality indicators and financial parameters to ascertain the efficiency and effectiveness of the transport system, rather than considering financial parameters alone. The context of this study is IR which is an engine for the continued socio-economic development of India. The overarching constraint is that the inputs are already established. Within this socio-economic contextual framework the analysis has been done to have an efficient and effective public transport system. Originality/value - This is the first study which incorporates the quality of service dimensions in performance measurement and benchmarking of the railway zones that make up a national railway system which is under public domain. Each of these characteristics offers its unique challenges and dimensions which makes the problem complex. This article advocates expansion of the scope for international management (IM) research, which accounts, not only for the social function and the political, economic, environmental and operational implications of IM development, but also inquiry into others impacted by management across cultures, as well as weaker groups in the IM spectrum. The article suggests that the scope of IM research can be expanded beyond notions of globalisation, efficiency and managerial issues, to incorporate the poor, the voiceless and the vulnerable. This article is a step towards understanding the range of IM issues and perspectives. It provides a framework that sets out the spectrum of issues that can contribute to a holistic approach in IM research; specifically, the need to keep people - all of them - in mind when undertaking research, for there are other stakeholders and people whose lives are impacted by IM and the activities of Trans National Corporations (TNCs). The aims, philosophies and ideological assumptions of research can be opened to challenge and debate in order to develop, and enlarge the scope of IM research © Richard Oloruntoba, 2006. Purpose - To highlight the failure of the tsunami early warning system and the challenges of successfully responding to, and managing a transnational catastrophe of this nature. The paper also highlights unique challenges in the management of this catastrophe and suggests potential strategies for good disaster response and management in this response and beyond. Design/methodology/approach - Primary data collection was by telephone interviews with experts in the South and South-East Asian region, supplemented by a comprehensive literature review of scholarly journals, reports from relief agencies and United Nations situation reports and bulletins amongst others. The scope of the paper is limited to the issue of a warning not been passed onto appropriate authorities in the region, the unique challenges of the relief response and the rehabilitation and reconstruction of the affected communities. Findings - From the study, there is a need for further investigation into the catastrophic warning failure; as reasons proffered by the early warning officials for their inability to pass on a warning to authorities in the affected area appear weak at this stage. The study also found unique geographical, political, economic and social challenges facing the international relief and reconstruction effort. Specifically some of the challenges include the management of the media and information, logistics and coordination, needs and damage assessment, donations and safety and security issues amongst others. In summary, the author found that there is also a need for foreign assistance agencies to be seen to be fair, to build trust and ownership of relief and reconstruction efforts amongst the local populace, as well as use local people as much as possible. Research limitations/implications - The study was conducted only 21 days (three weeks) after the tsunami catastrophe of 26 December 2004, hence it is a snapshot of events in the days immediately after the catastrophe. The relief action is an on-going event and there may be changes as new information emerges from the field. Practical implications - A world wide network of integrated submarine earthquake and tsunami monitoring and early warning system should be set up. Critical warning information in any potential disaster should be shared as inclusively as possible. Relief workers must be seen to be politically and religiously neutral, especially in the civil conflicts of Banda Aceh Indonesia. Finally relief and aid should be given on the basis of sound humanitarian principles such as need, not just on wider economic criteria. Originality/value - The study highlights specific potential challenges which relief organisations must deal with in responding effectively to the disaster, and in assisting to reconstruct the region. The paper proffers specific strategies for effective management of the international assistance effort. Finally, the study adds to the literature on developing countries and is valuable for governments, emergency and relief workers, policy makers in both developed and developing countries. © Emerald Group Publishing Limited. Security assurance across maritime trading systems is a critical factor for international business managers and in the evolution of international trade generally. A number of initiatives are underway focusing on security issues in ports and ships (International Ship & Port Security Code), customs inspections in international ports (Container Security Initiative) and whole-of-supply chain outcomes (Customs & Trade Partnership against Terrorism). The main purpose of the above initiatives is to reduce the likelihood of maritime-vectored terrorism; however inappropriate implementation of these programs could affect competitiveness. This paper suggests that the complexity of interaction between ports, maritime operations and supply chains create vulnerabilities that require analysis that extends beyond the structured requirements of these initiatives and creates significant management challenges. Also the paper highlights the need for enhanced crisis management capabilities within ports as part of a standard management repertoire and suggests a new classification scheme for mapping vulnerability within ports and across supply networks. The paper concludes that there is a need to examine the goodness-of-fit of these security initiatives against business efficiency and competitiveness, and to consider the training needs for crisis management capabilities that will allow private and public sector groups involved in global trade to effectively mitigate the threat of maritime terrorism and loss of competitiveness. © 2005 Elsevier Inc. All rights reserved. First seed corn funding for research on 'emerging' areas of logistics research. Dr Richard Oloruntoba discusses disaster relief. Could supply chain logistics principles be used to improve our humanitarian response to natural disasters?